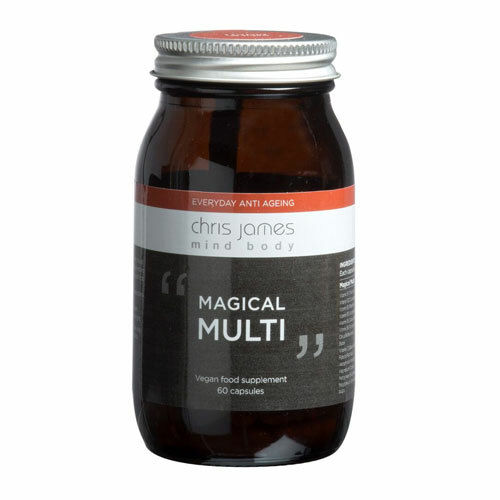 Chris James Mind Body Magical Multi Vitamin is an advanced everyday formula rich in antioxidants. It is designed to help defuse free radicals, fight off cell oxidation, and damaged tissue. Includes a full complement of vitamins and trace minerals, which may assist in bone formation, energy production and may help maintain blood alkalinity that are all wrapped up in heart-healthy CoEnzyme Q10. Vitamin B1 (Thiamine HCl), Vitamin B12 (Cyanocobalamin), Vitamin B2 (Riflboavin), Vitamin B3 (Nicotinamide), Vitamin B5 (Calcium Pantothenate), Vitamin B6 (Pyridoxine HCl), Citrus Bioflavonoids, Biotin, Vitamin C (Calcium Ascorbate), Folacin (Folic Acid), Ascophyllum Nodosum, Magnesium (Citrate), Manganese (Gluconate), Molybdenum (Ammonium Molybdate), PABA, Selenium (Methionine), Zinc (Citrate), Rutin, Iron (Bisglycinate), Chromium (Picolinate), Vitamin K1, Copper (Citrate), Vitamin E Natural (D-Alpha Tocopherol), Providing Alpha Tocopherol, Beta-carotene (from Dunaliella Salina), Boron (Sodium Borate), Vitamin D3, Co Enzyme Q10, Capsule Shell: Vegetarian Cellulose. Recommended intake 2 capsules on each day with food. Do not exceed recomended daily intake, unless directed by a healthcare practitioner. Below are reviews of Chris James Mind Body Magical Multi - 60 Capsules by bodykind customers. If you have tried this product we'd love to hear what you think so please leave a review.